Dr. Stein grows funny creatures, lets them run into the night. Helloween is a German power metal band. They played a pioneering role in this genre during the 1980s, earning them significant renown among metalheads. 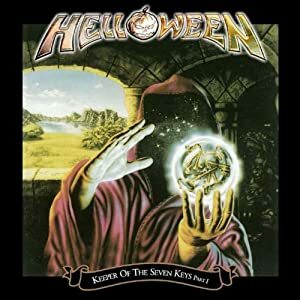 The song Dr. Stein comes from one their most famous albums, Keeper of the Seven keys, part 2. Known Relatives: Dr. Stein (“father” clone), Victor von Frankenstein (distant ancestor). Base Of Operations: Washington D.C.. Height: 4’9” Weight: 110lbs. Age: 46 (really 10). 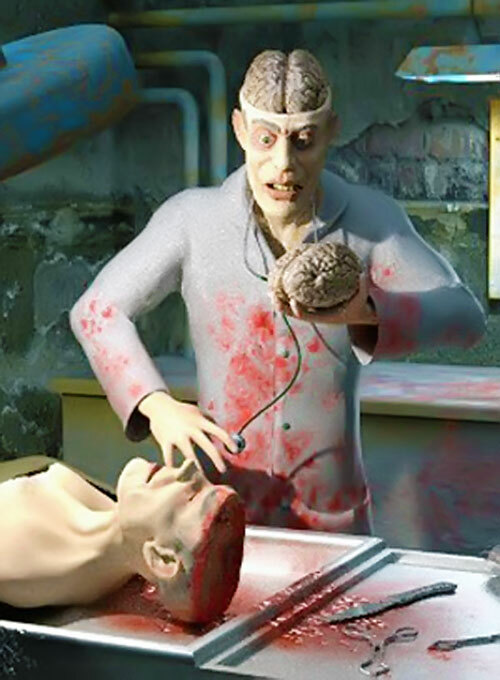 Both the original Dr. Stein and his current clone had vast knowledge on clonation and mutations. Dr. Stein is capable of cloning life with little effort, (just “mix some DNA, some skin and a certain spray”) as long as he has access to his computerized lab. He always carries a spray gun with his special mutation formula. It has specific neurotransmitters added that make his mutants more likely to obey him. At his hand is also a huge syringe capable of draining life…literally. He can use that lifeforce to restore health. Stein is proficient with both weapons. There’s no doubt we have here the best example of a self-made man, if ever there was one. Dr. Stein was from an early age thrilled with the power to create life. He acquired knowledge from the best teachers alive, plus a legacy of wise texts from equally obsessed relatives. The first steps of the original doctor went to duplicate Victor von Frankenstein’s creature. He managed quickly to master the process, but his monster died on a trap, killed by a bunch of villagers with stakes and torches. The next morning he left to a small flat on a skyscraper in Washington, where he thought he would at last be free of villagers. He was right: he followed his experiments by creating himself a girlfriend, in the shape of his beautiful assistant Wendy. She was the first that incorporated the neurotrasmitters that made every creature he mutates more likely to obbey his master. In some respects she was also the best : she’s absolutely loyal to the doctor and follows his every command. One night he cloned himself with total success. But he didn’t add the neurotransmitters as he thought that he would never betray himself. When he fell asleep that night the clone crept up from behind, took a syringe and slew him. Only the Steins know what happened that night… The slayer, the slain and the assistant. As always, Wendy was happy to obbey his doctor, even to clean that mess up. Usually dressed in black shirt and dark trousers, with a laboratory white coat over it, this short scientist of wild greyish hair surprises when he takes his coat out, as an orange pumpkin with fiery eyes and wild smile stares from the back of his shirt. Stein is always searching to further advance the bounds of science. That is something that can’t be managed without breaking law. Thus, he uses to work for supervillains, generally interested in getting genetically engineered soldiers, or cloned troopers to invade some small country. Among the organizations with whom he uses to work more comfortably there are the Troubling Trebles. He doesn’t care for petty concepts as “sides” or “justice”, because when science is at the stake, there is only one thing a real scientist can do : advance. Control: Only on creatures cloned or mutated by him (-2). Confined HQ, Credentials: Government (Medium), Genius, Pet [Wendy], Scholar [Cloning, Mutations]. CIA (Letting funny mutated creatures run among society), Oblivious. MutaSerum Spray Gun [BODY 03, Mutation: 12, R#:02, HP Cost: 126]. Life-Blowing Big Syringe [BODY 02, EV 02, Vampirism: 06, HP Cost: 35, Bonuses & Limitations: Vampirism: Drained BODY RAPs of the last victim can be stored for 1 hour and trasferred at touch range (+2); Must score at least 1 RAP with EV to use Vampirism (-1)]. Source of Character: Helloween’s Dr. Stein.